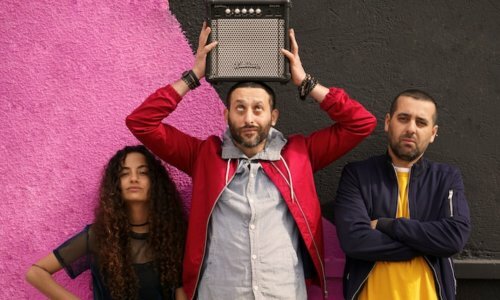 Heralded as “the spokesman of a new generation”, DAM began working together in the late 1990s as the first Palestinian hip-hop crew and among the first to rap in Arabic. Struck by the uncanny resemblance of the reality of the streets in a Tupac video to the streets in their own neighborhood of Lyd, they were inspired to tell their stories through this new medium. Bringing together a unique combination of Arabic percussion rhythms, Middle Eastern melodies and hip hop, DAM has grown to become one of the most influential acts of the Middle East’s urban music scene. In 2016 Maisa Daw officially joined the group with the release of their first single ‘#Who_You_R’ an incendiary critique of gender roles and social hypocrisy. Captivating and cunning, the group has been featured in Rolling Stone, Vibe, Q, Reuters, and The New York Times, and has appeared on MTV, CNN, BBC, and Al Jazeera. Recently signing with UK label Cooking Vinyl (Goldie, Groove Armada, Trio Joubran, 47Soul) they are gearing to release their new album Between Hannah and Mannah and will be playing at the Jazz Cafe as part of their highly-anticipated England album release tour in partnership with MARSM. Opening for DAM on this tour is none other than DJ Sotusura. The ever-cunning and creative DJ’s canny ability to mix classic Arabic samples with hip-hop, as well as his dexterity on the turntables, has allowed him to emerge as one of the most proactive members of the Middle East’s regional hip-hop scene over the past 15 years.